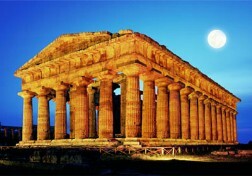 Paestum is a city of ancient foundation. It was born with the name of Poseidonia in the 6th century BC, built by the Achaeans, Greek colonists from Sibari who chose it as a maritime commercial centre.Tourist resort, Paestum is nowadays at the same time one of the most important archeological centre in Italy and a well-known seaside resort, with its large beach, lined with pine wood and rich of hotels and outdoor facilities. Entering the ancient city is like engaging in an extraordinary journey through time, for the indescribable charm possessed by the well kept monumental structures. The wall around the ancient town is one of the most important examples of town fortification from the Western Greek period. The group of temples, all close to each other, is also very impressive. The largest one is Poseidon's, built in 450 BC, considered by scholars the greatest example of Doric temple architecture, with its magnificent triangular frontons and the remains of two altars used for the sacrifices to goddess Hera Argiva. The most ancient temple is the so-called Basilica, of the 6th century BC, dedicated to Hera, of which 50 original Doric columns remain intact, the sacred well and the sacrificial altar. 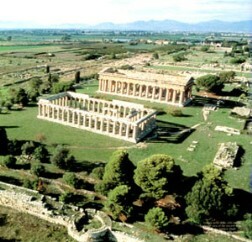 Then there is Cerere's temple, dedicated to Athena, with 34 fluted columns. The area is crossed by the Holy Road, along which many important civil and religiuous settlements have been found.You also ought to visit the National Archaeological Museum, where there are sculptures, bas-reliefs and tools from the excavation. Here you can also see the famous “Tuffatore”, recovered from a Greek tomb.